I don't normally buy pancake mixes since its pretty easy to make pancakes yourself with different gluten free flours, but sometimes you're lazy. Or I am, or my mom is. My mom loves this pancake mix, made by the Gluten-free Pantry, and I had some for breakfast the other day, and then mixed up a half batch for myself for this morning. I have to admit, it is really good. 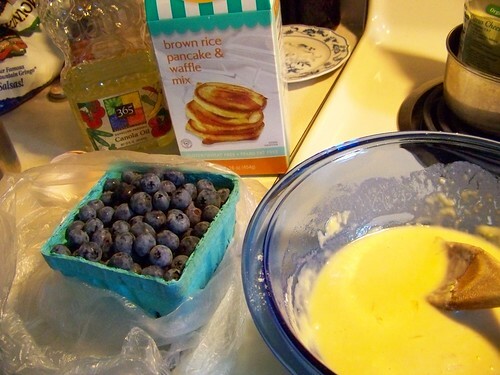 The mix makes fluffy pancakes that are thick and perfect. We put fresh blueberries in them and yum!! Check out my previous pancake recipes, if you click on 'pretty' or 'easy' in this post, for cornmeal or banana pancakes. I can't believe I haven't posted my regular pancake recipe, I'll get on that as soon as I get back to Philly where I have it written down! If you like the Gluten Free Pantry for the pancakes, you ought to try the sandwich bread if you want a bread that actually tastes like bread and not sand and grit. This bread... well my husband will eat no other... we buy out the stores stock every chance we get. Trust me, it is the best. I use Pamela's (I promise I don't work for them), and get really light and fluffy pancakes and muffinss. For the pancakes I use whole eggs or egg white and 1% milk instead of water and some times I add vanilla. Even my non-celiac family loves them. The mix is also great for muffins and all kinds of cookies, for which Pamela's offers recipes. I have a tiny kitchen and not a lot of time, so this mix is a life-saver.